Wouldn’t “Mocha-ppucino” be a better name for this product? That one’s free, TJ! I tend to avoid reviewing coffee drinks for the same reason I tend to avoid reviewing cheese and beer – I’m simply out of my depth when it comes to the breadth and depth of knowledge possessed by all the armchair experts out there. There was one guy who posted a comment about my Cold Brew Coffee Concentrate review that I’m still afraid to post because of its excoriating intensity and essay length. Nevertheless I’m going forward with this review of Trader Joe’s delicious Mocha Cappucino Mix because I figure powdered coffee drinks get a pass. I enjoy them, so I imagine that no self respecting coffee snob would be seen dead with a can of this stuff in his cupboard. Allow me to start out strong by saying, coffee drinks have always confounded me. I understand that coffee means water filtered through coffee grounds. What perplexes me is how the countless, subtle changes in this proportion lead to a bewildering array of different names. Coffee americano, expresso, macchiato, cortado, cafe latte, cafe au lait, frappucino – the list, I’m sure, goes on. I’m aware that some of these have milk in them, and some don’t, but that’s about it. Turning to the internet, I hoped to clear up this muzzy-headed understanding of what makes a cappuccino uniquely a cappuccino before today’s post. Sadly, I failed. The traditional definition of a cappuccino is an espresso, mixed with milk and topped with foamed milk, each in approximately equal proportions. On the other hand, a cafe latte also seems to be defined in the exact same way – the chief difference being that cafe lattes are served in larger cups that don’t have handles, whereas cappucinos are served in smaller cups with handles. In other words, the name of the drink changes depending one what kind of glass you serve it in – which is a daunting thought and one that I’m glad doesn’t apply to other categories of food. It’s possible that I’ve got this all wrong, so I’ll cite my source here – a slipshod wikipedia page. In any case, Trader Joe’s Mocha Cappuccino has nothing to do with any of this. There is no expresso, hot milk or milk foam involved at any point. Instead, there is a tin of powdered coffee, powdered milk and powdered chocolate that you mix with hot water. The results, rather surprisingly. are very good. I’ve been burnt by Trader Joe’s powdered milk and tea mixes in the past, burnt bad, so I wasn’t confident that their powdered milk and coffee mixes would be much better. Fortunately, I was wrong. It might be the chocolate that pulls it together, but a little this mix is quite good hot or cold. The balance between sweet, sugary chocolate (or mocha, as we may call it here) and bitter coffee is just right, giving you that Starbucks confectionery blast that may not make for a classical cappuccino, but sure is tasty. 20 grams of sugar per scoop makes this far from a health drink, but if you’re in the mood to buy a drink called Mocha Cappucino you’re probably ready to be a little decadent. 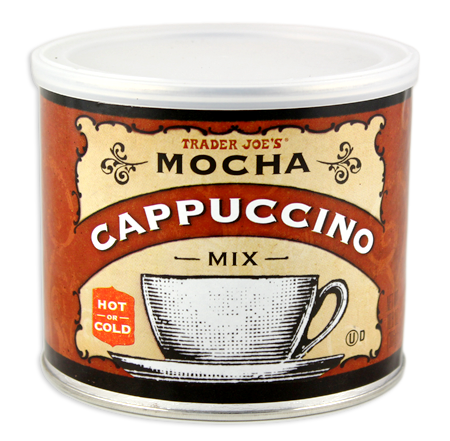 If there’s anything that bothers me about Trader Joe’ Mocha Cappuccino mix, it’s the powdered milk. While the drink certainly benefits from a touch of creaminess, it still leaves that lingering “I am not real milk” taste on the edge of your tongue. If TJ’s had just stuck to the coffee and mocha side, and let us add the cream ourselves, I’d have been happier. 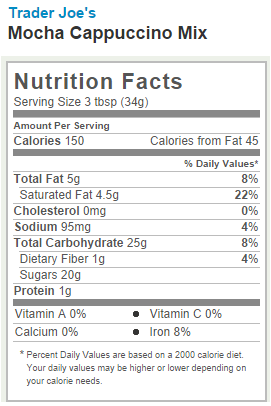 And even though the powdered milk still tastes like powdered milk, at least it’s natural powdered milk. Trader Joe’s is proud to boast that this mix doesn’t have any artificial flavors or preservatives in it, which is actually something of a rarity in the powdered coffee drink field. And really, in the end, it’s not really a deal breaker – at only $3.99 for the whole tin there’s more than enough value in it to justify the purchase. Would I Recommend It: Yes, if you want that Starbucks fix in the comfort of your home. Would I Buy It Again: Probably not, I’ll leave the coffee drinking to the coffee drinkers. Final Synopsis: A powdered chocolate and cappuccino mix that tastes better than it sounds. A cappuccino has less milk than a latte, so the espresso flavor is more pronounced. I’ll just leave it at that. I wasn’t a fan of TJs coffee concentrate, but i also make my own cold brew coffee so i’m probably not their target market for that one. I’m nuts about this stuff. I make my boyfriend stop into TJ’s each week to get me two cans (he often drives near it, but I’m 25 miles away.) It’s addictive. To me. Aldi’s makes a good one too, but only on the wonter. SND It’s slightly more chocolatey.